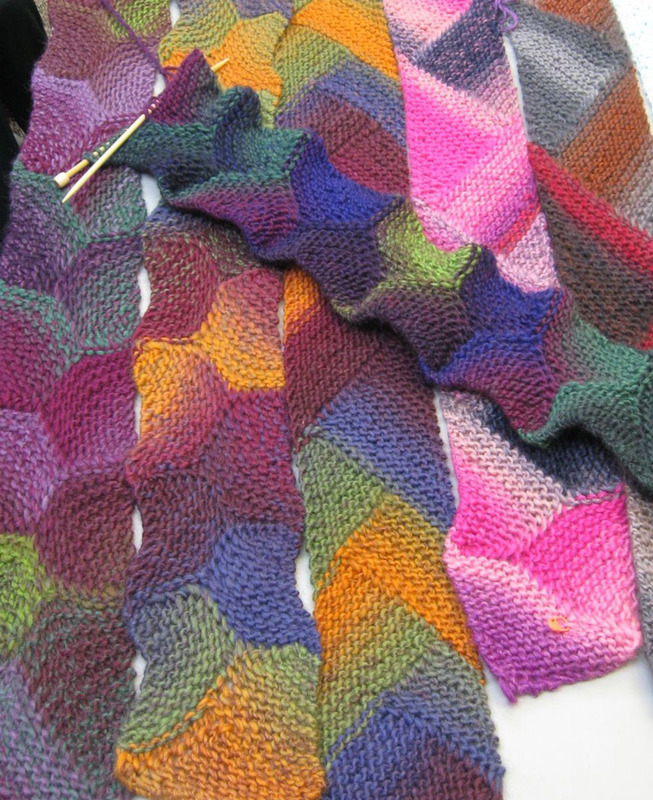 Short Row Corners scarves in Poems Chunky. Colorful chunky yarn + short rows = fast and fabulous knits! What a fun knitting workshop we had! Here are some of the resulting achievements from the short row knitting workshop using a soft and cuddly chunky wool yarn, called Poems Chunky [Universal Yarn]. Each project required only one ball of this yarn. 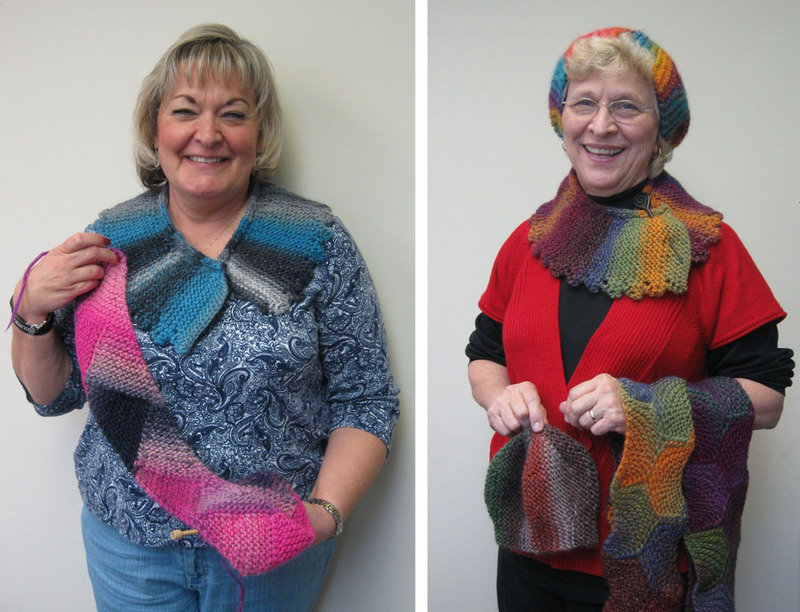 Two other short row projects, written by talented knitwear designers, were the Urchin hat by Ysolda Teague, and Kink, a neck warmer by Jodie Gordon Lucas. You can see the symbiosis between the color changes and short rows in these fabulous results. Kismet! 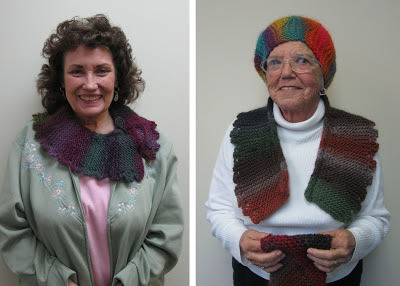 Sharon (left) and Lois with scarves, neck warmers and hats. Irene (left) and Pat (right) with their Kink collars. Here is one Urchin in progress. The color changes occur vertically rather than horizontally. And, what winter ensemble would be complete without a pair of mittens? Here are my AnyDay Mittens knit in the Sunken Treasure color way. 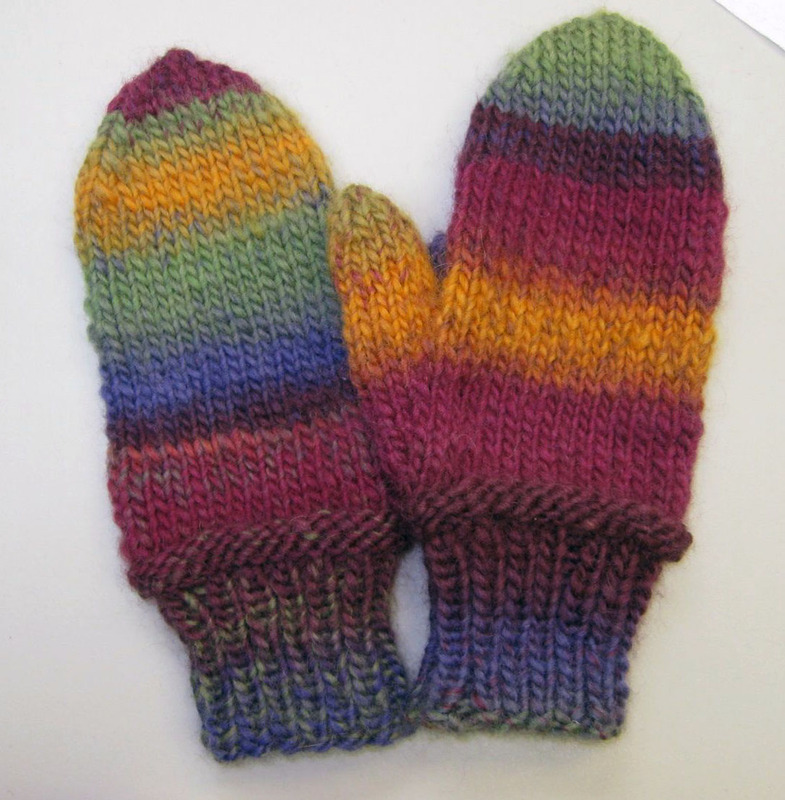 AnyDay Mittens in Poems Chunky (Sunken Treasure color). 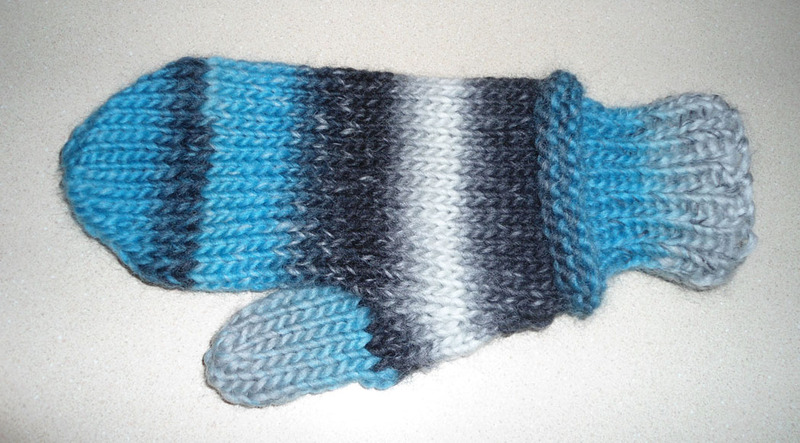 Lois knit this mitten in the Blue Mist color way. AnyDay Mitten in Poems Chunky (Blue Mist color). 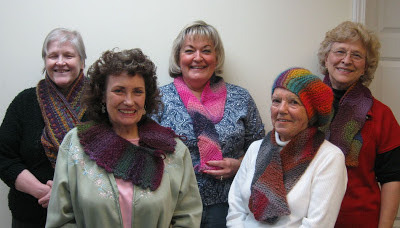 Thanks to the talented knitters for attending my Fast and Fabulous with Short Rows workshop with me. 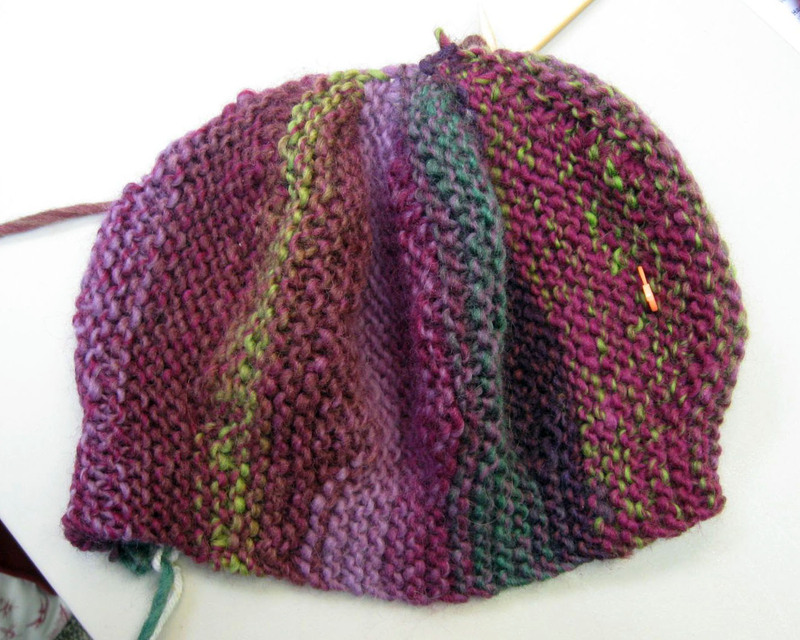 I had a great time and I hope you enjoyed learning the magic of knitting short rows. If you had to choose, which was your favorite project? Attendees in the Fast and Fabulous with Short Rows knitting workshop.